placeUvote helps you to schedule meetings and other appointments, create polls related to places or just share your marked maps with friends. placeUvote is simple, quick, free and requires no registration. 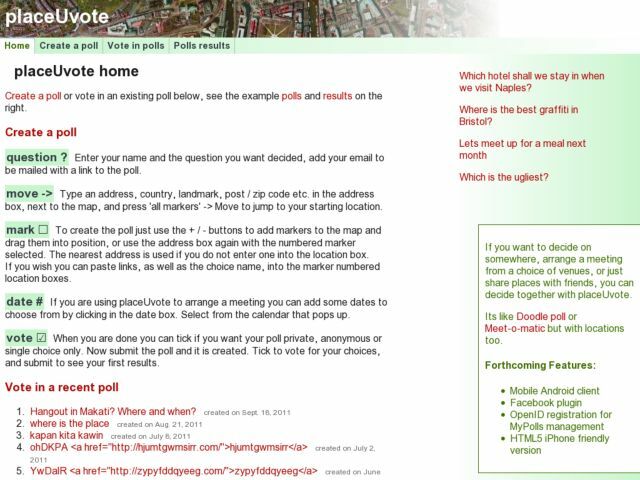 Simply set up a poll, send a link to all participants, watch progress online, and finally choose the most suitable place and date. like Doodle poll or meet-o-matic but with places, Facebook plugin and mobile - Android client as well.